So a lot of my coworkers are trying to eat healthier, and as the dietitian, I want to help them do so. So…I sent out a mass email to the clinic inviting any willing participants to contribute $1 for a bi-monthly taste testing at working during the lunch hour. I’ve committed to making a new, healthy, and easy recipe every 2 weeks for them to taste test and try at home. 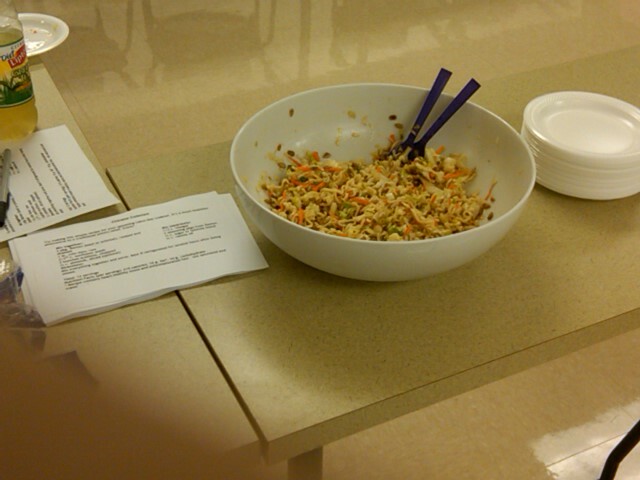 This week was taste test #1: Chinese Coleslaw. I had 9 participants and they were all impressed with the recipe. It is delicious and a perfect addition to any cook-out! I typed up and printed out the recipes for employees to take with them. For week #1 I will say I was really pleased with the feedback. Up next: Chicken Tamale Casserole! Mix everything together and enjoy! Best if refrigerated for several hours before serving. Any great, crowd-pleasing recipes anyone would like to share? Thanks in advance! 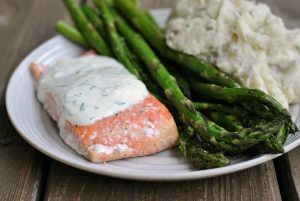 « Asparagus to the rescue! Can you please provide more feedback to your readers as to why this is healthy? I am not trying to sound negative…I am genuinely curious, because I have always been under the impression that ramen is full of fat and sodium and high in calories. With the addition of the almonds, oil and sunflower seeds, it seems like an excessive amount of fat to be considered a healthy lunch option, especially since it is only a side dish. That being said, I think it is a fabulous idea for your co-workers and I would truly enjoy something like this at my place of work. I was just looking for a little more information on this particular recipe. I used this recipe for a LOT of reasons, some nutrition-related, some not. 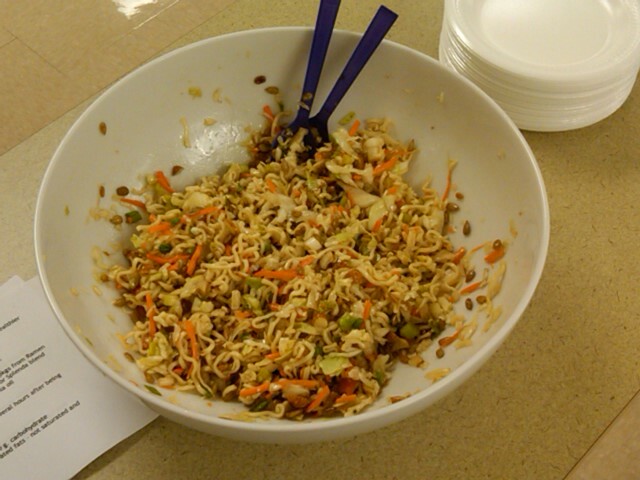 Reasons including time (I was at a diabetes conference until 10pm the night before), familiar ingredients (Ramen) that employees could relate to, it's a favorite recipe in my family which has been modified significantly to reduce calories and fat (original recipe calls for double the seeds, nuts, and oil, and also calls for sugar vs. Splenda-sugar blend), and lastly, because it's a great option in place of a high saturated fat side like potato salad. The dish is high in fat but nearly ALL of it is mono and polyunsaturated — the good kinds. Plus it's vegetarian, so it the protein from nuts and seeds will be higher than many meat-sources. I figured it was a great way to introduce something friendly to the general population that was healthier than something they may typically see at a cook-out. 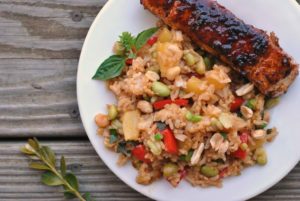 It is by no means a recipe epitomizing healthy eating, but it's a good option. I hope this helps! *higher fat than many meat sourcesOops!